I’m sure most moms can relate to the continual battle to get your child to eat vegetables. My mom would hide vegetables in lots of things and I know I ate many vegetables unaware. I don’t really remember liking many veggies until I entered into high school. Now, I love pretty much anything green and healthy but knowing it took me years to acquire the taste means I will probably face the same struggles my mom did. There are scientific reasons that doctors attribute to your child’s veggie aversions. Thousands of years ago our ancestors tended to steer away from bitter or sour foods because of the high probability they were poisonous. Most sweet foods were safe to eat so our preference for sweet foods is probably inherent. That makes me wonder about these kids that will eat stuff like basil leaves and kale chips. Where did I go wrong? I exposed Isaac to lots of flavors as a baby and he loved everything until he turned two. Was it my breast milk? Maybe I didn’t eat enough veggies when I was nursing him. Now I am eating my judgmental words that my child will never eat chicken nuggets everyday (I see my readers smirking right now). My favorite go to “sneaky” recipe is muffins. You can throw lots of veggies into a muffin without your child ever knowing it. I stumbled upon this super green powder while shopping at Wal-Mart and a light bulb came on. I could easily put this into a muffin by using it in place of either the sugar or flour. 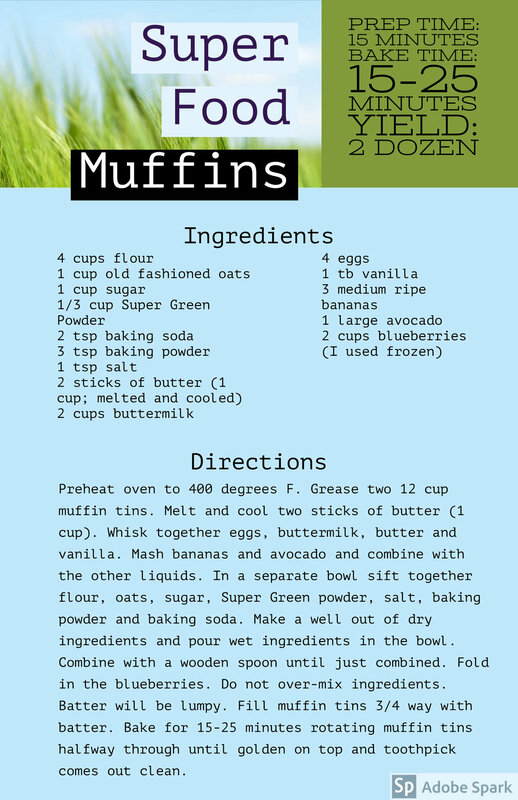 So, I will share with you my super food muffin recipe. Not only does it have stuff like wheatgrass, spirulina, and kale it also has avocados, blueberries and bananas. The best part is that Isaac eats them up without knowing they are full of veggies! As you mix the batter together, don't worry about the lumps. Just make sure to incorporate everything without over-mixing. Otherwise, you will get rubbery muffins. These turned out light and fluffy for me with a good amount of rise. You could also swap out two cups of the white flour for whole wheat but the Super Food powder has a lot of fiber so I didn't want Isaac's belly getting too upset! I chose to use white sugar which is what I had on hand. I've found that raw sugar will make the muffins brown faster so I can't guarantee the bake would turn out quite the same with a natural sugar. **Keep in mind that I live at 5,000 feet, so this is a high altitude recipe that may have differing results at sea level. High altitude recipes typically have a little more liquid and flour but less baking soda and baking powder.